The world produced about 200 million tons of petrochemical fertilizers (made from oil) last year. However, our existing food production system cannot continue to rely on oil because of the increasing oil prices. The world’s oil reserves are more heavily competed for than before. The “cheap” oil is becoming increasingly scarcer. A permanent decline in our material standard of living will occur unless we IMPROVE our lifestyles! 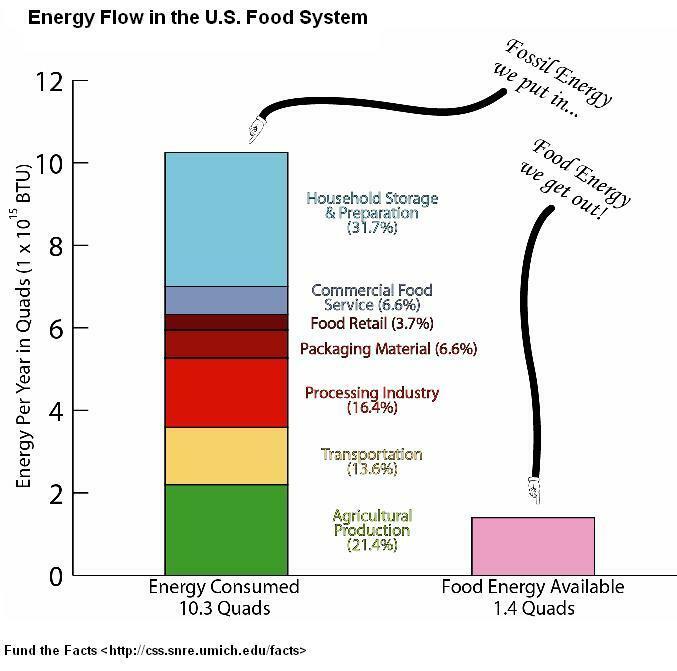 Energy breakdown for the food production system includes about 20 percent of overall energy used in agricultural production, 14 percent for transport, 16 percent for processing, another 7 percent for packaging, 4 percent in food retailing 7 percent in restaurants and caterers and a whopping 32 percent goes to home refrigeration and preparation. The actual figures are estimated to be about 40 percent larger than the the FAO numbers above. For the 2007 stats add another 8-10 percent! It’s time to learn <a href=”http://zoeyfarms.wordpress.com/tag/square-foot-gardening/”square foot gardening. That will eliminate a lot of the processing and energy loss.